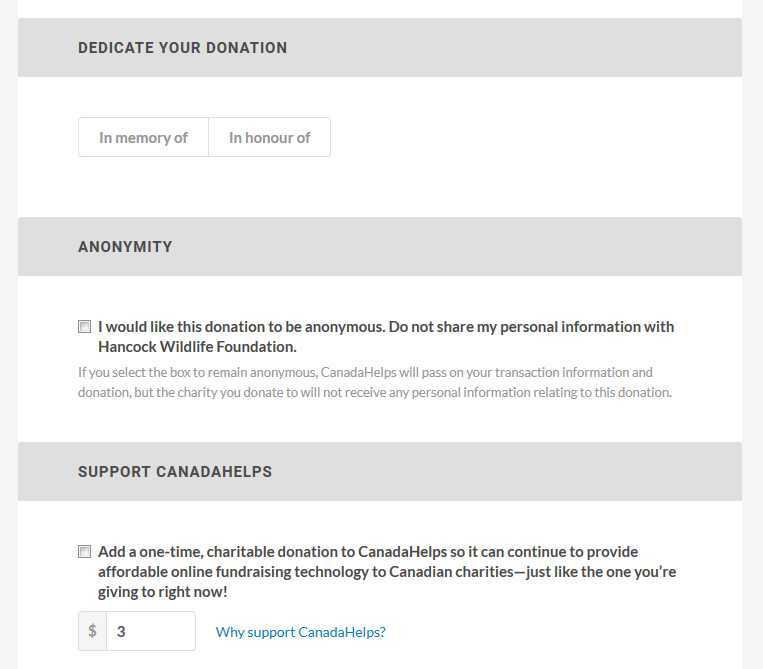 2017 update - our page at CanadaHelps has a new URL - www.canadahelps.org/en/charities/hancock-wildlife-foundation/ - we are trying to update our website, but you may still find some old links. 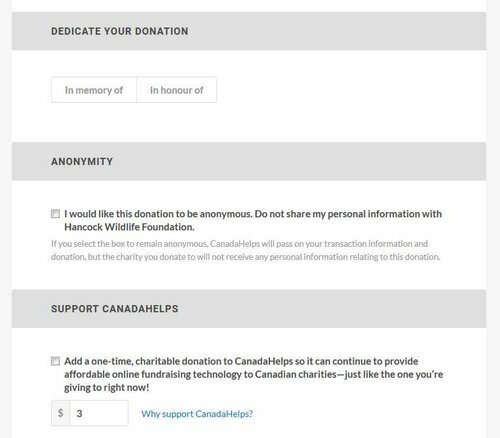 In their own words, CanadaHelps is "dedicated to increasing charitable giving across Canada by making it easier to donate and fundraise online." Here's the "nitty-gritty" stuff - How to Use CanadaHelps! 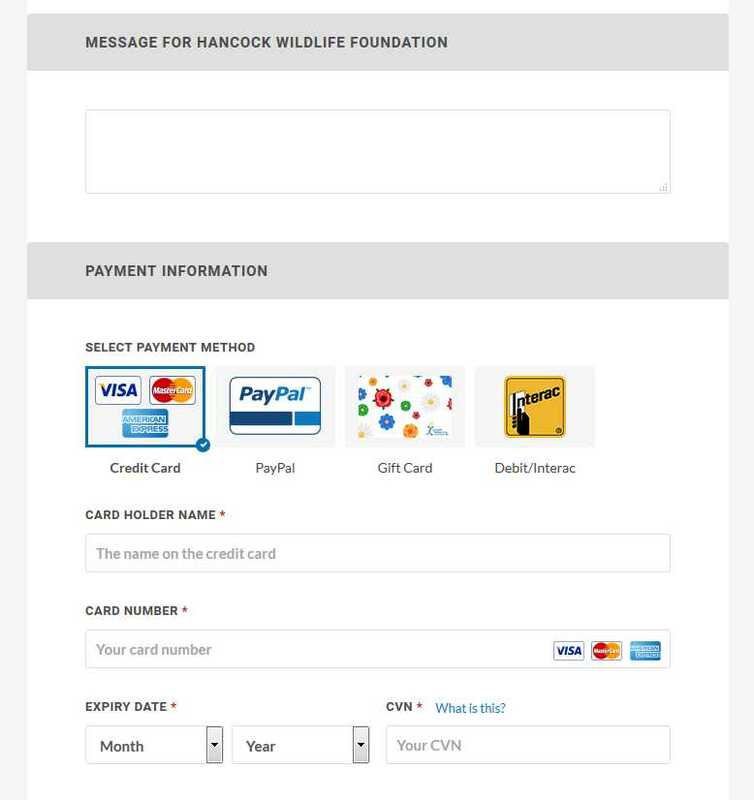 It confirms that the donation is going to Hancock Wildlife, lets you choose a suggested fund (and that is a suggestion - we do reserve the right to use all donations for the most immediate need), say whether this is a one-time/Donate Now donation, or whether you'd like to make a monthly donation - and enter the amount, which is in Canadian dollars (which is a good thing - you can adopt a nest for $250 Canadian - and you don't need to know exactly what that is in local currency - though you may want to check online to find what $250 Canadian is in your local currency so there won't be any sticker shock, so to speak). The "Message for Hancock Wildlife Foundation" box is where you can leave a message like - "I want to adopt the Harrison Mills nest - please list me as JudyB" - or "I'm making this monthly donation because I really love watching the new pair at Lafarge and am hoping you'll be able to keep that cam online" - or whatever. Please do tell us which cams you are watching - we are trying very hard to keep the cams at all four nests streaming for another year - but if money gets tight, all else being equal, those cams with more support will get more site visits and will have less down time. Below that is a section where you enter the usual information about your name and address. I'm not going to bother with a picture for that. I'm embarrassed to admit that we really don't have a way to pay respect to donations made in memory or honor of someone. 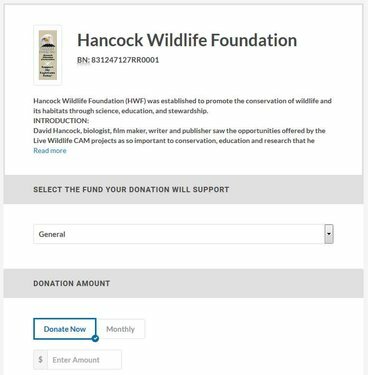 If you want to adopt a nest in memory or in honor, include that information in the text box above, and we will do that - but we need more volunteers to do follow-up before we can let the families of those honored know that a donation was made. So - if you'd like to make a donation in honor or memory of someone, that is wonderful - and please either let them know, or get in touch with me to discuss how to do this. You may make an anonymous donation - though I'm not sure how that would work if you are adopting a nest in someone's honor. If you don't see the honoree added in a few days, please contact me. We've been having some issues with our email system - but hopefully you can reach me via judyb@hancockwildlife.org - or you can send a message to our Facebook page https://www.facebook.com/Hancock-Wildlife-Foundation-284430480179/?fref=ts noting it's for JudyB (we have several admins, and I'm one of the less active ones, so that will make sure whoever sees it lets me know) - or send me a PM on the forum. And finally - you can add something for CanadaHelps if you want. 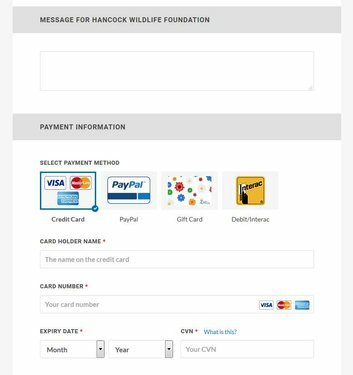 It really is a wonderful service - and a great way to support Hancock Wildlife! 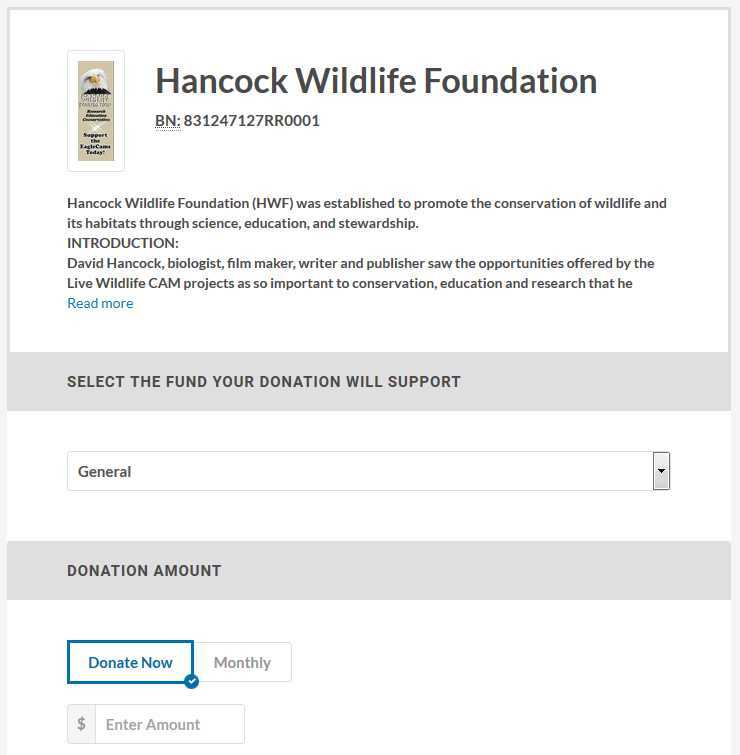 And so you won't have to scroll back up - here's the button if you'd like to adopt a nest, or sign up for a monthly donation, or support our work in whatever way feels comfortable for you. And - Thank You!